Kids in a candy store. That was me and Nicole when we stepped inside of Wurstküche in downtown Los Angeles, steps from Little Tokyo in the historic Arts District. Purveyors of exotic sausages with Belgian-style frites and 24 imported biers on tap, Wurstküche basically nailed the way to impress me with a business plan. Simple, to the point, flawless. 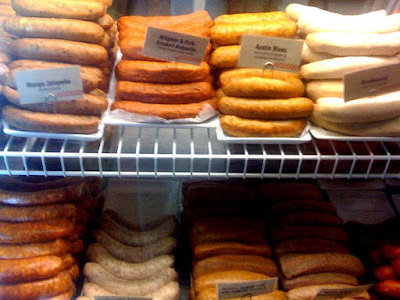 The case of sausages at the ordering counter made my mouth water as much at the cooler case at Scoops. Behind the counter a fire grill roasted a heaping pan of spicy peppers, several sausages popping softly over the flames nearby. We painstakingly selected from the long list categorized by Classics (brawtwurst, knockwurst..), Gourmet (Filipino Marharlica, Louisiana Hot Link..), and Exotic (alligator andouille, rattlesnake & rabbit..). Picking condiments for the fries was almost as difficult. When we got stuck on the beer list, the very patient man at the counter gently let us know we could get our drinks at the bar in the dining area, and seeing the lunch time line mounting behind us, smiled sheepishly and paid him for our food. Down a hall and around a corner is a large dining area with communal picnic table style seating and some small tables along the windows. An open door leads to sidewalk seating outside. The brick space is breezy and open, minimal and comfortable. A long bar with architectural stools has little behind it but a long row of stainless draught spouts and a line of Chimay Blue magnums. The amiable bartender helped us through the list of Belgian and German specialty ales, letting us taste several before we selected. 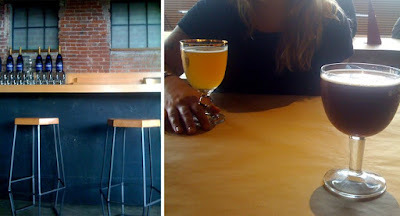 I enjoyed the rich St. Bernardus - ABT 12, Nicole a lighter Belgian. The hazy sun filled the room through factory windows. I could see myself sitting here often, I thought. By the time our food arrived, the high alchohol beer had already started away at my early afternoon head, and sausage never looked so good. We got two varieties to share, the first a no-brainer: duck & bacon with jalapeño peppers, topped with spicy peppers and sauerkraut. Say what?? Yeah. Rich and fatty in flavor, juicy and satisfying with a hint of good spice. we also got the rabbit, veal & pork with white wine, topped with caramelized onions and sweet peppers. Softer and elegant, this was a tasty sausage, but the indulgent duck & bacon took the cake. The Belgian fries were thick and crispy, with spicy chipotle ketchup & pesto aioli. The chipotle ketchup was so good and seemingly simple, I immediately began to think about making it when I got home. Probably the most satisfying overall lunch experience in quite some time, Wurstküche easily slid into my Summer Top 10. Check it out right away, but if you get lost trying to find it and need to stop for directions (it's a little tricky) just don't pronounce it phonetically, you may end up in a different part of downtown. 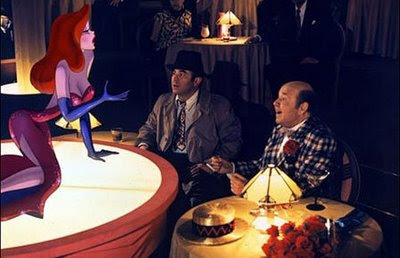 No, it's not the cartoon penguin-run club where Jessica Rabbit performs, but as the freshly opened Roger Room does not allow photography of any kind, I was forced to get creative. Following the cocktail-centric Golden Era speakeasy trend, Jared Meisler and Sean MacPherson (Bar Lubitsch, Jones) hit the vibe nail on the head with The Roger Room. Neon fortune teller signs outside on the street hide a dark and cozy interior lit with dim table lamps, walls adorned with painted circus panels. The charm win is immediate. Immediately a round of water tumblers were brought, an unexpected nice touch for a serious cocktail bar. Another moment and our three attractive concoctions were delivered. RC's drink, the Japanese Maple (Yamazaki Scotch, pure maple syrup, lemon juice, egg white, crushed ice) was smokey and smooth, served up in a crystal-cut coupe. My Spiced Mule (Saylor Jerry Spiced Rum, ginger juice, lime juice, vanilla, nutmeg, cinnamon, club soda, rocks) was gingerrifically spicy and tart. Cara's pick The Four Aces was the winner of round one, Monopolowa vodka, fresh basil, green grapes, lime juice & Canton Ginger Liqueur on the rocks. Brisk and refreshing, the perfect cap for a warm sunny Los Angeles Saturday. The pleasantly sparse room began to fill. The Hollywood types absent earlier began to filter through the heavy entry curtain in layering wafts of cologne. The giddy tinkering of tunes and upbeat conversation turned garishly loud and almost grating. Every other person to squeeze past our small booth bumped my drink-holding arm. At this juncture we debated drink #2... But decided to take advantage of our prime booth and stay for it. This time I opted for the Scarlet Aperol Fizz (The Scarlet Ibis Rum, Aperol, lemon juice, egg white, crushed ice), which was sharp and fuzzy, interesting but overpowered by the bitterness of the Aperol. Cara's Spring Street (Effen Vodka, mint, orange juice, Galliano and crushed ice) was a crisp twist on a mojito. RC's simple Death In the Afternoon (Le Tourment Vert Absinthe & champagne) was the favorite this time, the round mousse of the sparkling wine a remarkable foil to the cloying anise of absinthe. Take note, Virgin America! These small but pesky service issues aside, I very much enjoyed the ambiance of the space and the meticulously mixed menu. I do look forward to returning, the secret obviously to arrive early. One lovely service the bar offers is the ability to put your number down for a seat when at capacity, then once one becomes available, the bar will ring you. Drinks from the list I look forward to trying in the future include the Old Sport (Cap Rock Gin, black tea-infused Soho lychee liqueur, cucumber juice, lime juice, up), the Thug (Maker’s Mark Bourbon, Baronjager Honey Liqueur, lemon juice and spicy habanero bitters on the rocks), and Flim Flam (gin, Cynar artichoke liqueur, Luxardo Maraschino, Sambuca Molinari). Join me for a late night treat this Friday at my favorite movie house in LA - the Silent Movie Theatre. Brilliantly run by the Cinefamily, this month's FRIDAY MIDNIGHTS series ("Far East Funnies") is going culinary slapstick. Those familiar with Chinese box office powerhouse Stephen Chow only through his recent import releases Kung Fu Hustle, Shaolin Soccer and now CJ7, will be in for a pleasant surprise with this rare showing of his comedy masterpiece. God of Cookery, a send-up of the Triad gangster genre in the gag-a-second style of Mel Brooks, is shot through with a lethally black sense of humor, full of delirious wildly-paced physical comedy and dense pop culture references, and is filmed in gorgeous 35mm 'Scope. Chow plays the ultimate Iron Chef, a culinary con humiliated by a competitor and deposed (literally) from his throne. 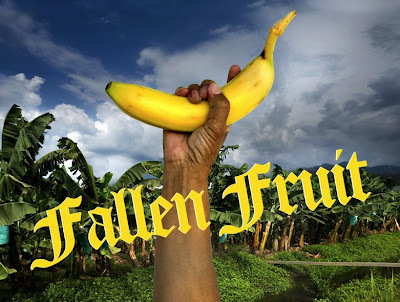 From there, it's a steep climb back to the top, as Chow navigates culinary gangs, Shaolin monks, hit men and divine intervention itself in this one-of-a-kind slapstick genre stir fry. Dirs. 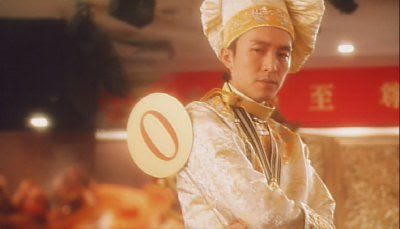 Stephen Chow & Li Lik-Chi, 1996, 35mm, 95 min. 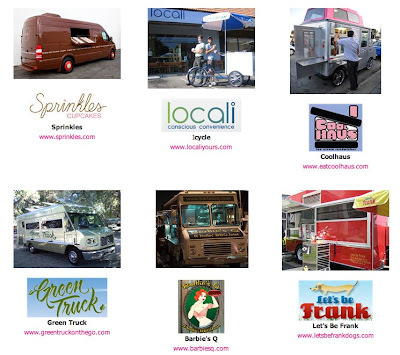 In conjunction with their Night at the Movies event this Saturday June 27, Dwell On Design 09 will be corralling some of LA's favorite mobile eateries for the city's first mobile restaurant row. Square Meal on Wheels, this temporary street food bazaar will include a classic taco truck, a modern hot dog cart, organic fast food, ice cream sandwiches, cupcakes and more. (Note: the movie ticket price does not include food). 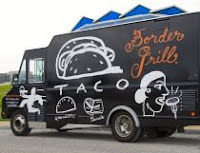 On other mobile news, Mary Sue Milliken and Susan Feniger's brand new Border Grill taco truck has begun its rounds serving braised achiote pork tacos topped with orange-jicama slaw, tangy mahi mahi ceviche cones, and hot churro poppers. Follow on Twitter and Facebook for location updates. 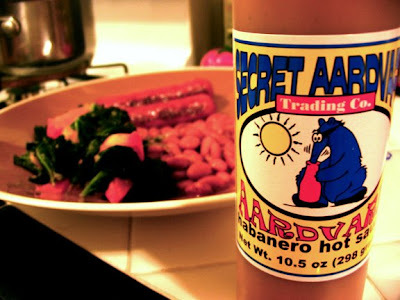 Scouted on the tabletops of Portland's hottest cafes, my friend Cara came back from her last trip up North with a strong desire to own a bottle of Secret Aardvark habanero hot sauce. Being a "Portland sauce for Portland tables," I knew this PDX-made "secret" alternative to Cholula for local restaurants had to be something special. Cara promised I would want a bottle too, and I believed her. Luckily standby Portland vegan grocery Food Fight! has an online shop that sells it to outsiders. And for this favor, I - and my mustard greens - are indebted to Cara for life.. 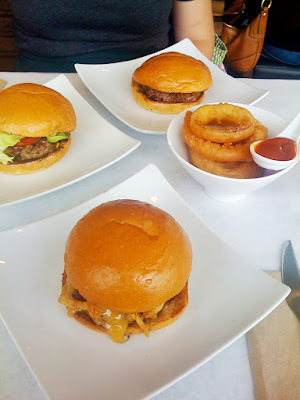 I've been DYING to try Umami Burger since it opened. Why on EARTH did it take me so long?? At least I was in the perfect company to enjoy it, Seattle-based chef Nicole Burrows had just flown into town and we were famished. 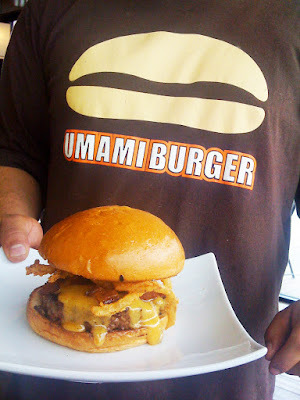 Umami to the rescue! The small, unassuming space on South La Brea could be a health food joint, with yoga paintings and bonsais the only adornment to the minimal space. The stamped burger logo on the paper table cover and lone steak knife let us know not to worry, major carnivorous satisfaction was on its way. The service was quick and congenial, casual and honest. We ordered three burgers to split, and an order of malt liquor tempura onion rings. They were out of Mexican Cokes, sadly, the perfect accompaniment to any greasy salt-bomb. We started with the Port & Stilton Burger, Umami's signature juicy 6 oz burger smothered with port-caramelized onions and gooey blue cheese. Wow! What a juicy burger! What flavor! I didn't taste the port, but enjoyed the robust, moist treat. The Umami bun also needs to be addressed, a soft and buttery brioche-like compliment - not at all the thick foamy carb-load that fills you up first almost everywhere else. We sampled the onion rings, large, puffed, crispy savory donuts - super tasty, and very filling. Dessert, I deemed them, and returned to the burgers. Next we tried the Manly Burger, an Umami burger piled with beer cheddar, bacon lardons, and crispy fried onions. Even better! Smokey and satisfying, something I would easily order again. But it was the Triple Pork Burger that stole my and Nicole's hearts... This burger patty is made up of fresh ground pork spiced with chorizo and cob-smoked bacon, topped with aged manchego, lettuce and pimento aioli. I felt taste buds in the back on my mouth where I didn't know I had them. My eyelids fluttered a little, and noise making was not optional. This is, I feel, their namesake reaction, and admirably achieved with.. the juiciest and most flavorful burger I have ever eaten. I have a new crack, and it starts with a U.
Preheat oven to 350 degrees. Grease an 11-inch loose-bottomed tart tin with a little butter. For crust, combine 1/2 lb room temperature butter, sugar, flour and salt. Knead with hands, adding additional flour until dough forms a ball. Roll the dough out and line your tart tin, pressing lightly into flutes. Bake the pastry crust for around 12 minutes or until lightly golden. In a small saucepan, cook the other 1/2 lb butter over moderate heat until the milk solids brown and the butter is fragrant, about 7 minutes. In a medium bowl, beat the eggs with the sugar until thick and fluffy, about 3 minutes. Beat in the flour, then slowly temper in the browned butter. 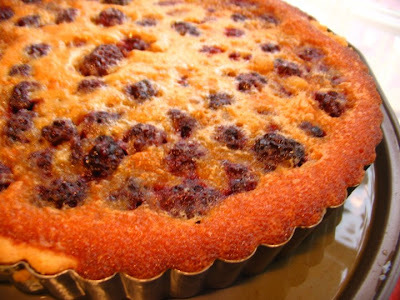 Arrange the berries in a single layer inside the tart shell. Pour the custard over and bake for 45 to 50 minutes, until the custard is puffed and richly browned. Transfer to a rack and cool. Simply wrap in a flour-sack kitchen towel and head off to the party! 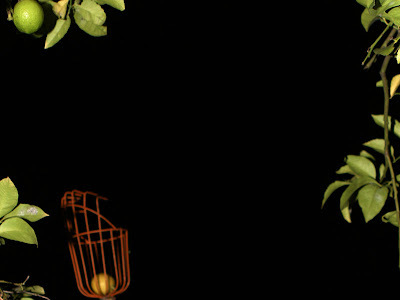 Orange blossoms are in the air! 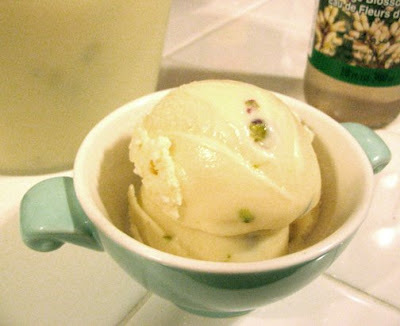 I had a similar ice cream to this at Mashti Malone's in Hollywood a few months ago and I've been craving it ever since. As my Donvier ice cream maker has sat under the sink unused since I got it for free at a yard sale 2 years ago, I decided it was time to get off my hands and put two and two together.. Beat eggs and milk together in a large sauce pan. Add sugar and cook over low heat, stirring constantly until thickened, so mixture smoothly coats spoon (approx. 10 minutes). Cool, then add cream, vanilla and orange blossom water. Refrigerate overnight. Transfer the mixture into an ice cream maker and follow the manufacturer's instructions (note: I didn't add the pistachios until midway through mixing the ice cream so they wouldn't sink to the bottom). Ciudad hosts a special four-course dinner of Caribbean-inspired dishes like star anise-scented duck confit each course paired with a different Zaya Gran Reserva 12-year-old Estate Rum cocktail. Goat's milk flan, a snifter of 12-year-old rum and a hand-rolled cigar are dessert! The Top Chef Tour bus rolls into LA! Meet Top Chefs Hosea Rosenberg and Fabio Viviani, and stay for cooking demonstrations, gourmet tips, and tastings. Free; seats will be available on the day of the show on a first come, first served basis. 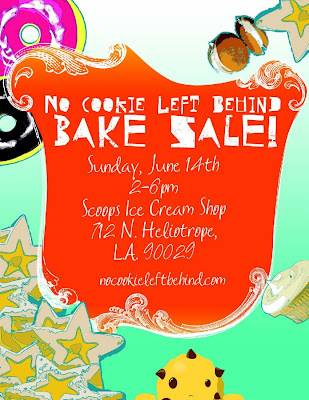 No Cookie Left Behind, as part of the Great American Bake Sale will peddle cupcakes, quiches, and cookies outside of Scoops for Share Our Strength, an organization that combats childhood hunger in the US. Vendors include Lark Cake Shop, CakeMonkey, Spork Foods (vegan! ), Large Marge Sustainables, Kiss My Bundt Bakery, Whisk LA, Taste on Melrose, Laurel Avenue Bakery, and more! Sunset Junction French fave Cafe Stella now serving Brunch! Bask in the long overdue sun from their prime patio location with Eggs Benedict, lemon-ricotta pancakes, brioche with clarified butter, fleur de sel and maple syrup, bay leaf blackberry mimosas, and coffee drinks made by the neighborly baristas at Intelligentsia. First noticed on a National scale for her former Portland, OR-based catering company Ripe's innovative and cultish Family Supper, followed by several years of holding poise following the crumble of business empire (and marriage) with partner Michael Hebb, Naomi Pomeroy has made it clear she's only just getting started. Her newest endeavor, Beast, is a cozy innard-pink-painted space in NE Portland opened in September '07 with business partner and sous chef Micah Camden (think of Beast as the big sister to LA's Animal - of which, coincidentally, chefs Jon Shook and Vinny Dotolo joined Pomeroy this year as winners of Food & Wine Best New Chefs of 2009). Beast hosts two nightly seatings (6 and 8:30 pm) only, during which you'll enjoy a six-course prix fixe meal of masculine-feminine meat-centric seasonal fare "inspired by French grandmothers" ($52), all prepared in a tiny open kitchen with two gas burners, an oven and a prep table. Pomeroy has opted to keep things intimate - but unlike the bustling, invite-only, catered vibe of Family Supper, with Beast Pomeroy is more welcoming you for a low-key, memorable meal in her home. 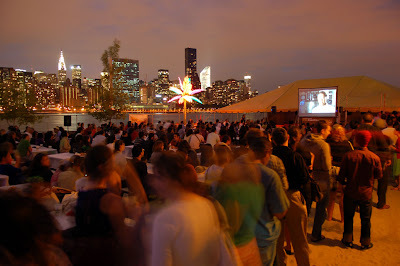 This Sunday June 14th, Beast is hosting the second in their series of six Summer Wine Dinners. 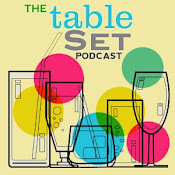 This week will feature guest Tad Seestedt of McMinnville's Ransom Wine Co.
$95 per person Including all food, wine & gratuity. Speaking of Australian cookies... I've had this Anzac Cookie recipe kicking around for ages and finally whipped them up last night in my obsessive orange blossom haze. ANZAC stands for Australian and New Zealand Army Corps - Most stories tell of these cookies (or "biscuits") being made by Australian and Kiwi women for soldiers during WWI. The simple, spoil-resistant ingredients made them easy to store and ship, also as they were then baked quite crisp (read: inedibly hard). The recipe has surely changed much since WWI, and everyone likes theirs baked differently (thin and crisp v.s. soft and chewy). 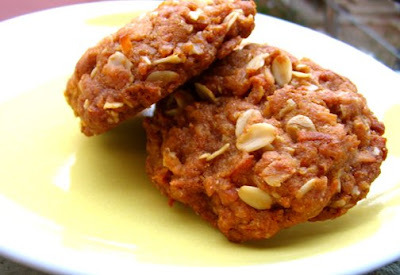 One of the signature ingredients in this Anzac cookie recipe is golden syrup - tricky to find here in the United States (shh, I substituted honey - It gives the cookies a slightly different flavor, but is delicious just the same). This recipe also includes orange zest and orange blossom water, which you might exclude for a more authentic biscuit. There are many other things you can do with the tasty Anzac dough - great as a cobbler topping, or even a tart base. Leftover cookies keep well in an air-tight container for a few days. Preheat oven to 325F degrees. Combine the dry ingredients in a large bowl; flour, oats, sugars, and coconut. Mix well. In a small saucepan over low heat combine the butter syrup (or honey), and orange zest. Stir until melted and remove from heat. In a small bowl whisk together the boiling water and baking soda. Stir it into the butter. Now pour the butter mixture over the big bowl of oats and stir. Add the orange blossom water and stir again. This is a dough I like to mix it with my hands to make sure the butter is evenly distributed and the dough is moist throughout. I baked this batch of cookies in a well-buttered, heart-shaped cast iron pan, but you can simply drop them by the tablespoonful onto parchment lined baking sheets. Make sure they aren't too flat or they will get crispy. Bake for about 12 minutes or until deeply golden. Makes 18 - 24 medium cookies. 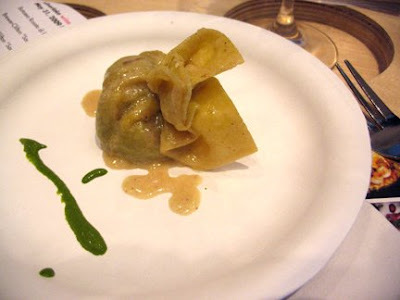 Michael Ruhlman's blog is like.. serious food bloggin', people. 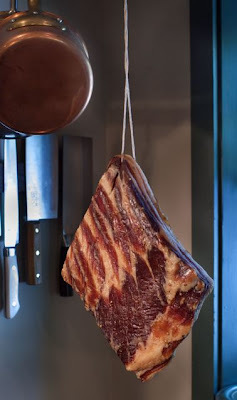 Food world celebrity, cookbook writer and instructional guru, Ruhlman's accomplishments are vast.. And one of his most recent posts on making home-cured pancetta spawned an exciting new contest open to anyone who purely loves to cook: the first BLT From Scratch Summertime Challenge! Entries will be judged in three categories: best photograph, best overall preparation, and best interpretation of a classic. The last category requires explanation. An interpretation means playing off the original. To make an overly simplistic example, a BLT salad, lettuce and tomato with a mayo dressing, lardons and croutons made from homemade bread; an Alinea-inspired version might be lettuce ice cream served on a crouton, topped with deep-fried mayo and a caramel bacon sauce, garnished with powdered tomato. The interpretation must include one of each of the main ingredients: homegrown tomato and lettuce, a home-cured meat, some form of mayonnaise or emulsified sauce, and some form of yeast-leavened baked good. Vegetarian, vegan, and gluten-free interpretations are welcome! If there are enough, they may warrant their own category. Submissions will be accepted through Friday, August 28th. Send pix and any notes or recipes to michaelruhlman@gmail.com. (DO NOT send to the main "contact" email address or it may get lost!) Winners will be announced on Labor Day Weekend. Books of mine will serve as token prizes; internet fame and glory will be byproducts of the real prize. An awesome sandwich you really made yourself. Time to plant some tomatoes and brainstorm! Enter with me! Thanks for the tip Joanna! Sake House Miro makes me happy. Starting with the tall, bright light box that is wheeled onto the sidewalk at 6:00pm to let you know that yes, they are open. 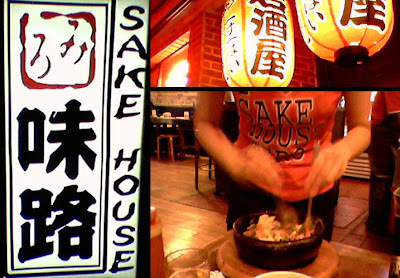 The young Japanese servers are spunky and sweet, garnering bright red t-shirts with various logo rip-offs ("Enjoy Sake House" in leiu of Coca-Cola; "I [heart] Sake House Miro" a la NY). The space recreates a 1960s Tokyo back-alley vibe, with exposed brick walls, vintage advertising posters and strung lanterns. The menu is eclectically Japanese, with sushi, Teppan grill, "tapas" (Nan "pizzas", Japanese style fried chicken, salads), and a handful of Korean dishes. The first time I went to Sake House, it was the sake arriving in a wooden box and the Bee Bim Bap that won me. Yes, I order the Korean dish Ishiyaki Bee Bim Bap fried rice every visit back (beef and vegetable served over rice in sizzling earthenware bowl, tossed to desired spiciness table-side). The tasty Albacore Sashimi Salad w/ house spicy ponzu dressing is always a refreshing respite, along with house complimentary cucumbers & peanut sauce starter and a cold Sapporo. I have never been rushed, and groups don't seem to be discouraged despite the cramped quarters, wooden stools (not unlike sitting on a vegetable crate) are produced and people get cozy. The environment breeds happiness, from the Ultraman movies on the TV monitors, to the laughing kitchen to the loud pop music overhead. Sake House is also just around the corner from the El Rey theatre, which makes it a perfect alternative to Luna Park for a more low-key pre-concert bite. The last time I was there I asked if the t-shirts were for sale, because I do [heart] Sake House Miro! 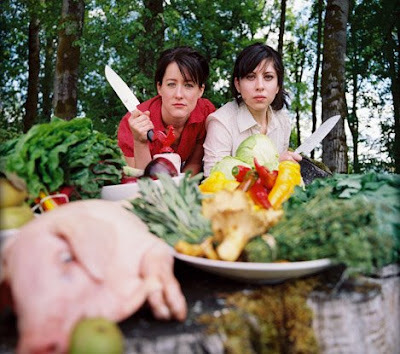 Carnish Culture: Food Party premieres on IFC tonight! After failed dating experiences, Thu realizes that she is actually in love with herself, and sets out to marry Thu number 2. 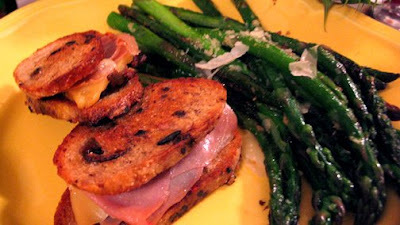 Grilled miniature sandwiches on kalamata olive bread of smoked gruyère, prosciutto, and tapenade; Asparagus sautéed with garlic, fresh thyme, sea salt and olive oil, topped with parmigiano reggiano. Melt-in-your-mouth. The first time someone tried to explain Mr. Pizza to me I thought they were seriously pulling my chain. 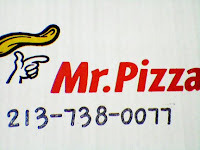 A Korean pizza chain (with only ONE location in the United States - on Wilshire in K-town right down the street from the Wiltern), Mr. Pizza Factory is an intriguing "take" on the loose "idea" of pizza. Don't go expecting anything.. authentic. Rather, imagine a far east pizza joint based off of.. Super Mario Bros. and refrigerator leftovers, and you're halfway there. 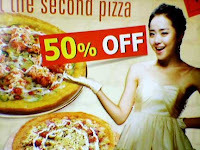 Their wacky Korean website has a baffling "Women" theme.. the Mr. Pizza tag-line apparently "Love For Women." It's really the everything-but-the-kitchen-sink way of building pies that gets American folks (and my) attention. 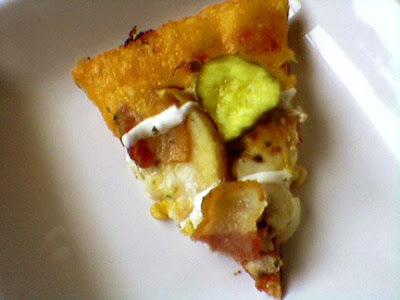 More or less their signature pie, the mystically titled Potato Gold is really what to order at Mr. Pizza. The "screen" (traditional) and "tortilla" (thin crust) pizzas get overwhelmingly blah reviews from American diners, it's the exotic bits that are worth going out on a limb for. 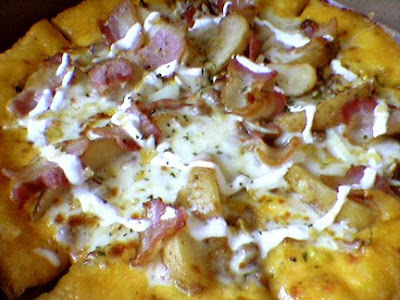 So what is a Potato Gold pizza? It starts with a "salsa" base (regular tomato sauce) on a sweet potato crust, piled high with thick cuts of bacon, hefty potato wedges, ground beef, corn, onion, mushroom, nacho chips(! ), and sour cream - but here's the kicker - the crust is stuffed with sweet potato mousse, and the whole enchilada is covered with crispy cheddar cheese, and a side of sweet pickles of course. Sounds pretty intense, yeah? It is. Though one "Large"(13") pizza runs a steep $23.50, know that one slice may just be enough here. And gosh, two birds, one stone - dessert is built right in! The crunchy sweet potato finishing bites are pretty much the best part. So the next time you crave something about as Italian as Porco Rosso, or don't know what you feel like eating.. Heck, just eat everything. On one sweet potato pie. Donuts and The Salvation Army go all the way back to the battlefields of France in World War I when Salvation Army “lassies” made donuts for US soldiers. 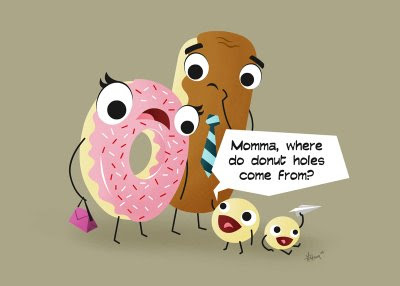 National Donut Day began in 1938 in Chicago by The Salvation Army as a means to raise funds for people struggling in the depression era economy. In August, 1917, fighting raged near Montiers, France, as soldiers huddled in camp - hungry, weary and drenched by 36 consecutive days of rain. In a tent near the front lines, Salvation Army lassies made donuts by filling a refuge pail with oil. 100 donuts made that first day were an immediate success. Soon, as many as 500 soldiers stood in muck outside the resurrected tent waiting for the sweet taste of donuts and, before long, 9,000 donuts were being made around the clock. That tent, operated by The Salvation Army, became the first 24-hour donut shop! The Salvation Army is commemorating National Donut Day this Friday, June 5 at the iconic Randy’s Donuts located at 805 W. Manchester Blvd in Inglewood. Beginning at 7:00 a.m. Salvation Army “lassies” in vintage uniforms as well as Salvation Army officers and the perennial red kettle will be on hand to celebrate the donut and the continuing work of The Salvation Army which provide some of the most comprehensive social services to those in need in Southern California. BakeMark, an international supplier of baking supplies to independent donut shops across the nation, especially Southern California, is spearheading a fundraising campaign in conjunction with National Donut Day. 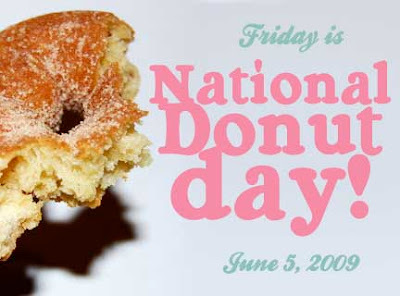 BakeMark will make a donation to The Salvation Army for each donut sold on June 5th, 2009, by all donut shops displaying the National Donut Day poster (above). If you crave something a little more.. upscale, check out Grace's National Donut Day tasting menu - A flight of Salted Caramel, Pistachio, and Buttermilk Brown Butter Glazed donuts paired with dessert wines (be still my heart!).. Thank you Silver Lake Wine for a pretty perfect Sunday afternoon! 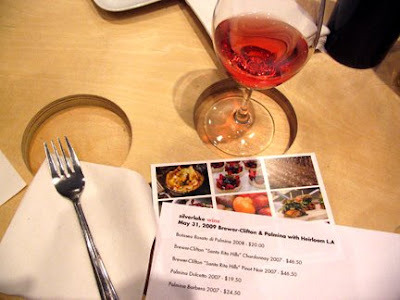 I have been meaning to attend their popular Sunday at Three food paired wine tastings for ages, and the exuberance from Silver Lake Wine leading up to this past weekend's pairing of fresh hand-made pastas from Heirloom-LA and stellar wine from Brewer-Clifton and Palmina sold me. Winemaker Steve Clifton was in the house to introduce each tasting, while Heirloom-LA's Matthew Poley explained what they in turn created to pair with each delicious wine. The folks of Silver Lake Wine ran the 100 person event in their small shop like a well-oiled machine, and with their signature casual, good natured dispositions. Kudos to all involved, it was an experience my palate won't soon forget! 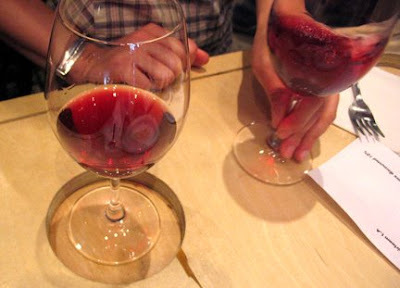 Steve Clifton waxes poetic about our first taste, Palmina Botasea Rosé 2008. Actually a "Rosso Biondino" (a very small bottling of a Rosato), Botasea (translates to “Red Blonde”) is a creamier pink wine, initial floral, plum and vanilla layers melting into crisp acidity and mineral notes for a drier finish. 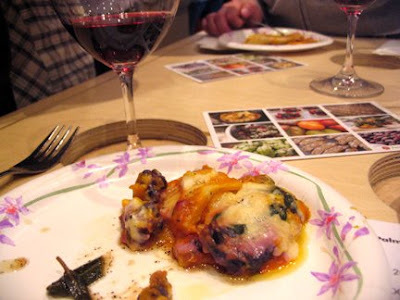 For the next taste, a Brewer-Clifton Chardonnay Santa Rita Hills 2007, Heirloom-LA passes around Organic Spinach and Confit Baby Artichoke Stuffed Borsette with Parmesean Cream. This is when the tasting really got fun. Wanting to showcase the flavors of Central Coast California, not the flavors of toasted French Oak, Clifton opts to age his wines in stainless steel and keep the focus on the fruit. Thus, this is not your mother's vanilla-rich Chardonnay. It is fresh and vivacious, quince and citrus sparkling on the palate. The delicious tender Borsette ("bank burglar bag") was a stellar match, the herbs popping like a fresh garden next to the wine. As I was, I saw the people around me also scraping every last drop of the drizzled English pea puree from their plates! The next pair was the afternoon's highlight. 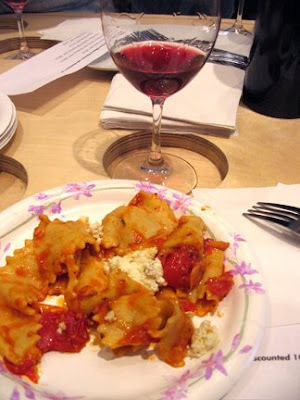 Brewer-Clifton Pinot Noir Santa Rita Hills 2007 paired with Pappardelle w/ Housemade Pancetta Amatriciana and Nutmeg Ricotta Cheese. The first thing out of my mouth tasting this Pinot was "this is so good it could be Oregonian!" (haha!) From me, that is an incredible compliment, as I hold [my old home] Oregon's Pinot Noir as a cornerstone of brainy, complex, and transcendent winemaking. Clifton's fermentations are largely carried out as whole clusters where the stem inclusion contributes tannin and savory notes from within the fruit, and this Pinot Noir couldn't make that more apparent. With a heavy mouthfeel bursting with rich fig, pomegranate, and dark berry fruit, this wine just tastes like luxury. The Pancetta Amatriciana (made with Guanciale - salt-cured pork cheek) was similarly indulgent and BIG, rounded out by plump ripe cherry tomatoes, creamy ricotta and the heavenly fresh pappardelle. A slam dunk (my date and neighbors all agreed - we could do simply with more of this.. Lots more). Though it was difficult to let our empty Pinot glasses go, the Palmina Dolcetto 2007 with Hand Rolled Potato Gnocchi w/ Colorado Lamb Ragu and Pistachio Gremolata came next. Dolcetto (loosely translated as “the little sweet one”) is the wine of Italy’s northern Piemonte region and is meant for casual enjoyment with good food. What better wine for today?? In a very different, modest way the Dolcetto won us with its no-nonsense drinkability, lush dark cherry, pepper and cocoa notes and bright acidity. This is actually the bottle I took home. 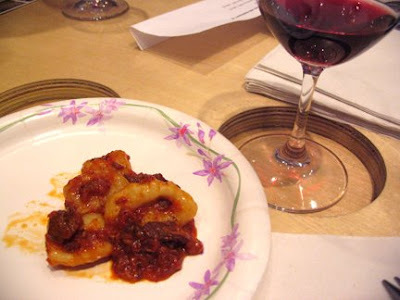 The gnocchi was perfectly prepared, a delicate form for the flavorful lamb ragu. Back and forth between the Dolcetto and the gnocchi... I was not alone in my enjoyment, the room may have been its quietest then. Could this really be ending? Our last pair was the Palmina Barbera 2007 served with Carrot and Romanesco Lasagnette w/ Sage Maple Brown Butter and Burrata. Perhaps since Clifton had already found my sweet spot, the Barbera made the least impression on me, not to say it wasn't tasty! Another lovely food wine, the Barbera is bright and fruity, the sage of the lasagnette bringing out more herby floral notes from the currant and berry-full wine. 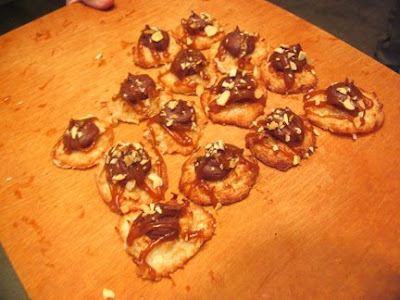 We saved some Barbera to enjoy with the tray of lovely soft and buttery coconut cookies being passed around afterward, drizzled with fresh caramel and chopped almonds over a pillowy milk chocolate button. Yes, on the too-short walk back to the car, my date and I rubbed our bellies, happy as clams, feeling refreshed rather than bogged down following a large meal, and decided Sundays should really always be just. Like. This. 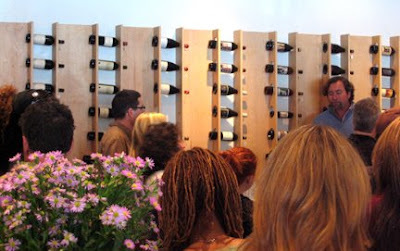 This Sunday 6/7 at 3:00pm: Heirloom-LA takes on Qupé Wines. Be sure to call and make reservations. Wow. Bless those Australians. Especially those Australian neighbors who knock on your door to drop off a box of Tim Tams ("Australia's Favorite Cookie") because Grandma sent too many of the addictive morsels from Down Under. Bless! How to describe the Tim Tam experience? Well, imagine two thin rectangular biscuits sandwiching a creme filling somewhere between that of an Oreo and squishy marshmallow fluff. In the case of my Sweet Surrender Black Forest Delight flavored Tim Tam, the filling also contained a jelly ribbon of dark cherry. The whole sandwich is then covered in sweet chocolate. The sensation of biting into the Tim Tam is what must sell the popular treat, a bona fide texture explosion, first soft like a candy bar, interrupted by a satisfying biscuit crunch that quickly gives in to the squishy creamy filling. Oh heaven! Do that, Girl Scout Cookie! My sister Megan made this interesting preperation of asparagus the other night, so I had her snap some pictures and send the recipe. This method "steams" the asparagus but without water which helps keep its vivid color. So simple and looks delicious! Preheat oven to 350 degrees. Get a paper shopping bag large enough to hold the asparagus comfortably. 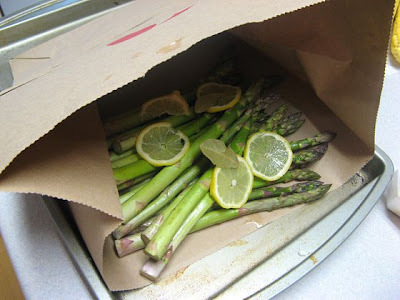 Place the asparagus inside and drizzle outside of the bag with olive oil (will keep it from burning). 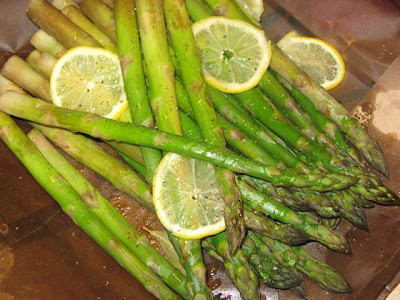 Sprinkle the asparagus with salt and pepper and cover with lemon slices and the bay leaf. 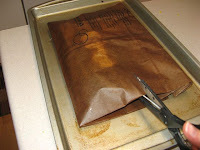 Close the bag, folding it over several times and creasing the folds well to hold the steam in. 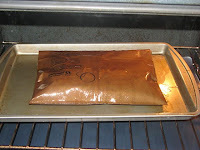 Set the bag on a baking sheet and drizzle with more olive oil to saturate. Place the sheet in the oven on the middle rack and bake for 20 minutes. Remove sheet from the oven and set on the stove beside a serving plate. Using a kitchen towel or tongs with a pair of durable kitchen shears, cut the bag open very carefully so as not to burn yourself on the steam. Slide the asparagus out onto the plate. Drizzle with a little more olive oil and serve.